On 30th August, my friend Aaron and I will be on our way to Europe for an inter-railing tour of 4 European countries. I've mentioned this trip a lot in #budgettravelhr, so I thought it was about time that I gave you a run down of our trip itinerary. We'll be starting at London Stansted and flying into Budapest, Hungary. We've got three nights in Budapest and after seeing lots of recent blog posts about the city, I can't wait to visit. It's supposed to be a cheap city to visit, so hopefully we'll be able to see lots of amazing tourist sights without it costing too much. We'll then be heading across the border to Austria and staying in Vienna for 2 nights. There's a brilliant high speed rail service between Budapest and Vienna, so the journey should be around 2.5 hours. We chose Vienna as our next stop largely for this reason; we want to spend as little time as possible on the train during this trip. This will be my second time in Austria but first time in Vienna - I went to Salzburg in 2011. I was in Prague for 5 nights back in April, so this is really just a brief stop on the way to Berlin. Vienna to Prague is around 4 hours, which is still not too long a journey. We'll be in Prague for 2 nights, having a relaxing couple of days before getting the last train of our trip. Our final destination is Berlin. Berlin will probably be the most jam-packed part of our trip as there's such a long list of sights we want to see. I've been to Berlin briefly before, but I hope to explore a lot more of the city on our inter-railing trip. We'll be in Berlin for 3 nights and the journey from Berlin to Prague is also around 4 hours. We'll then fly back to the UK from Berlin, with lots of stories and photos from our tour. I can't wait for our trip, we've been planning it since last September. Now it's July, it really is only just around the corner. Have you ever been inter-railing? This is so exciting, I can't wait to hear all about your adventure! 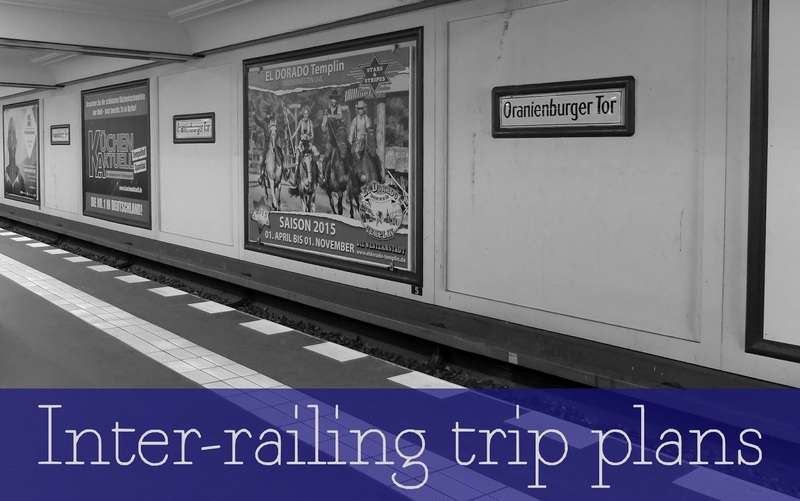 I went interrailing last summer and it was almost the same itinerary! We did it the other way around and did Kraków instead of Vienna. Sounds like an amazing trip. Enjoy! Some amazing places to see!